Could slowing down the swimming speed of the Lyme disease spirochete help treatment? The pathogenesis of the Lyme disease bacterium depends on its ability to migrate into human tissue. The virulence of the Lyme disease spirochete could depend on its swimming speed, according to scientists. The authors of “Vancomycin Reduces Cell Wall Stiffness and Slows Swim Speed of the Lyme Disease Bacterium” report that antibiotis in vitro could negatively impact spirochete survival by impeding their swim speed. Vancomycin reportedly reduced the swimming speed of the Lyme disease spirochete by about 15% by reducing the cell wall stiffness. The researchers chose vancomycin to examine the effects of antibiotics on cell wall synthesis. 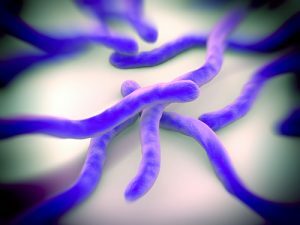 Vancomycin “has previously been shown to be active against B. burgdorferi in vitro” in two studies identified by the authors. [2, 3] The researchers were also able to alter both the shape and speed of the Lyme disease spirochete in vitro. The investigators at the University of Arizona, Yale University, and University of Bayreuth are to be congratulated on increasing our understanding of the role of Lyme disease spirochete motility. Harman MW, Hamby AE, Boltyanskiy R, Belperron AA, Bockenstedt LK, Kress H, Dufresne ER, Wolgemuth CW: Vancomycin Reduces Cell Wall Stiffness and Slows Swim Speed of the Lyme Disease Bacterium. Biophys J 2017, 112(4):746-754. Dever LL, Jorgensen JH, Barbour AG: In vitro activity of vancomycin against the spirochete Borrelia burgdorferi. Antimicrob Agents Chemother 1993, 37(5):1115-1121. Hunfeld KP, Weigand J, Wichelhaus TA, Kekoukh E, Kraiczy P, Brade V: In vitro activity of mezlocillin, meropenem, aztreonam, vancomycin, teicoplanin, ribostamycin and fusidic acid against Borrelia burgdorferi. Int J Antimicrob Agents 2001, 17(3):203-208. Bruniera FR, Ferreira FM, Saviolli LR, Bacci MR, Feder D, da Luz Goncalves Pedreira M, Sorgini Peterlini MA, Azzalis LA, Campos Junqueira VB, Fonseca FL: The use of vancomycin with its therapeutic and adverse effects: a review. Eur Rev Med Pharmacol Sci 2015, 19(4):694-700. No Replies to "Could slowing down the swimming speed of the Lyme disease spirochete help treatment?"